I found this recipe onhttp://stephysweetbakes.com and loved it. (Do check out that blog..but not if you are very hungry because excessive drooling may occur. Don’t say I did not warn you! )I decided to make it for a Friday night because my husband works hard and deserves some spoiling! And chicken is..as my mother would say, cheap and cheerful. Heat oven to 400 degrees F. Line a large rimmed baking sheet with aluminum foil. Now flip the chicken and press it down towards the work surface so it flattens slightly. 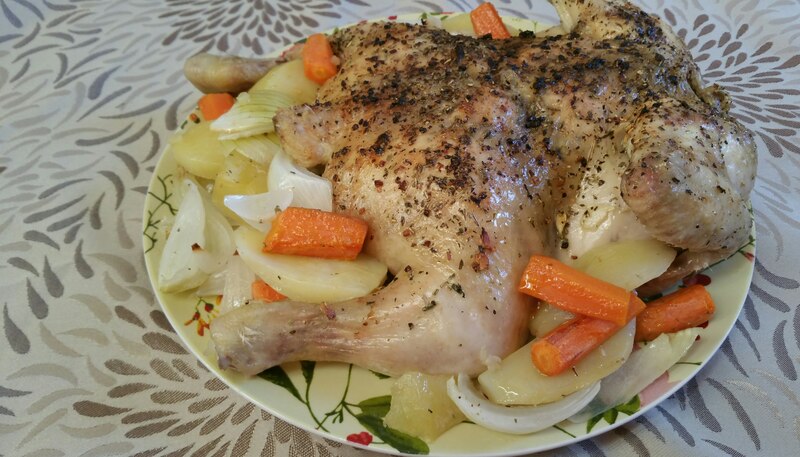 Arrange vegetables around chicken on baking sheet. Place halved lemons, cut side up, around vegetables and chicken. If wet, pat chicken dry with paper towel then rub both sides of the chicken with the oil, rosemary, salt and freshly ground black pepper. (I also remembered Julia Child’s advice about massaging the chicken. I lifted the skin on the breast carefully with my fingers and rubbed the oil and spices in. The result is a juicy gorgeous chicken) Sprinkle other seasonings on top as desired. Squeeze Lemon juice on chicken. 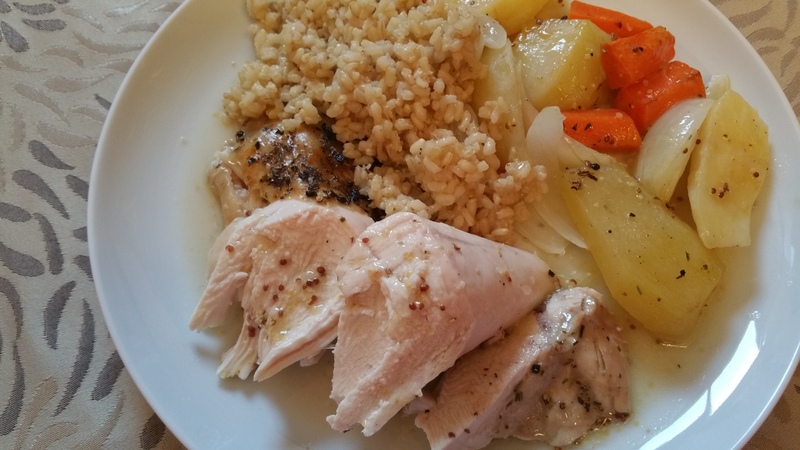 Place chicken breast-side up on baking sheet. Roast the chicken for about an hour. After 30 minutes of roasting, rotate the baking sheet so the chicken cooks evenly. To make the Roasted Lemon Vinaigrette sauce, use tongs to squeeze juice from roasted lemons into a small bowl. Add the mustard then stir. Add oil, salt and pepper to your taste preference. Your recipes look so tasty that I am wanting to start cooking here although it is very early in the morning! !